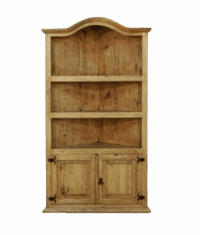 Our rustic corner cupboards are uniquely designed, functional, affortable and will look great in your home. We offer a few styles, and designs to meet your needs. 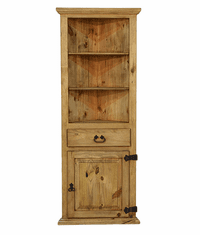 Our rustic corner cupboards from Mexico are hand made from kiln dried pine wood then constructed, stained, and waxed revealing the incredible detail and character, resulting in the classic, unmistakable southwestern rustic look. After construction, each piece is hand waxed with a medium honey finish to enhance the rustic beauty and appearance. 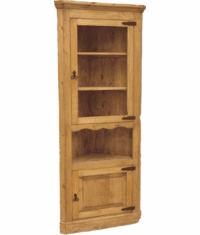 These cabinets are made with kiln dried pine wood, frame, tops, sides, bottoms and drawers, partical boards are used on the back. All units comes assembled in one piece. 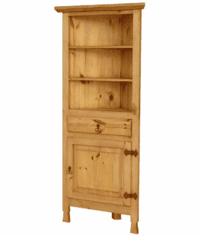 The Durango & Arizona rustic oak corner curio cabinet are made in Asia. 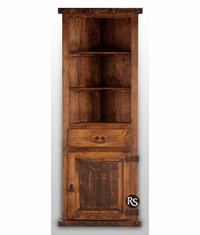 **NOTE: All rustic corner cupboards are handmade and unique to give a one of a kind look. Imperfections will exist in appearance, texture, size and/or finish. Plus, the color shade of each piece may have slight variation, because they are made with natural products applied by artisans and lighting condition of the image taken, the actual finish will vary in appearance from any examples shown. In addition, worm-wood may be used to enhance the rustic apperance. Normal cracking of your kiln-dried rustic furniture adds to the handcrafted beauty and uniqueness of the piece, so it may not be considered a defect. If you have any questions, please call us toll free. 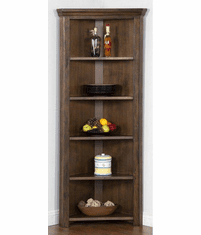 "Your Rustic Corner Cupboards Store"